Although Android 8.1 has been out for a few weeks now, Google interestingly hasn't stopped adding new features to its latest software release. Case in point: speed labels for public (open) Wi-Fi networks. This functionality has started rolling out today. Once you get it, you will see an estimation of how fast each nearby public Wi-Fi network is, as portrayed in the screenshot to the left. The levels are Very Fast (20+ Mbps), Fast (5-20Mbps), OK (1-5Mbps), and Slow (0-1Mbps). These labels should help you quickly decide whether it's worth connecting to such a network, hopefully saving you some time when you encounter a slow one - time otherwise spent waiting and waiting for things to load. Unfortunately, this doesn't work for password-protected networks. 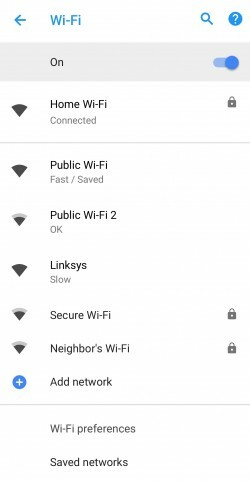 If for some reason you don't like the speed labels you can turn them off by going to Settings > Network & Internet > Wi-Fi > Wi-Fi preferences > Advanced > Network rating provider and choosing None instead of Google.